You are here: Home / nutrition / Want to Recover Faster with Less Pain? While popular superfoods like blueberries, kale and Chia seeds tend to garner the lion’s share of attention, there are plenty of other superfoods that pack a similar punch when it comes to antioxidants, vitamins and other nutrients. One of the lesser known superfoods that offers a variety of health benefits is the tart cherry. This “endurance superfood” packs a higher concentration of anti-inflammatory nutrients than regular cherries. Among other health benefits, tart cherries and specifically tart cherry juice have started to gain more and more attention in recent years as a way to potentially reduce muscle damage and pain associated with intense exercise. Several recent studies have found that the antioxidant and anti-inflammatory properties of tart cherries can help reduce the muscle damage caused by intense exercise such as weight training, high intensity interval training (HIIT) and long-distance running. These activities create microscopic tears in the muscle fibers, which then triggers an inflammatory process followed by an increased production of free radicals that the body struggles to release through the detoxification process. This combination of inflammation and accumulation of free radicals can quickly lead to muscle soreness, stiffness, decreased muscle production and fatigue. While many runners and exercises turn to non-steroidal anti-inflammatory drugs (NSAIDs) like ibuprofen to relieve these pain symptoms, studies have shown that tart cherries offer a natural anti-inflammatory alternative that can reduce muscle damage and pain to the same or greater degree than NSAIDs, and without the potential negative side effects associated with NSAIDs. In most of these studies the tart cherries were consumed as tart cherry juice regularly or for several days prior to (and after) an intense workout or race to help the participants feel reduced pain both during and after the exercise. And the anti-inflammatory benefits of tart cherries extend beyond intense exercise. 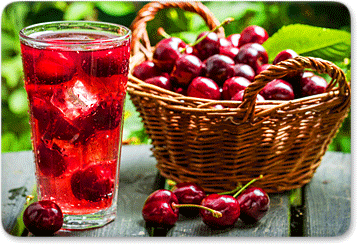 Tart cherry juice is also regularly recommended for its therapeutic benefits in the treatment of gout and inflammatory joint and muscle pain conditions like arthritis and fibromyalgia. These are just two of many health benefits associated with tart cherries. Next week we’ll look at how tart cherries can also help you sleep better, boost your immune system, and help beat belly fat. So make sure to give this sweet-tasting endurance superfood a try leading up to your next big workout session or competition, and let us know how tart cherry juice works for you in our comments section below. Kelley DS, Rasooly R, Jacob RA, Kader AA, Mackey BE: Consumption of bing sweet cherries lowers circulating concentrations of inflammation markers in healthy men and women. J Nutr. 2006, 136: 981-986. Wang H, Nair MG, Strasburg GM, Chang YC, Booren AM, Gray JI, DeWitt DL: Antioxidant and antiinflammatory activities of anthocyanins and their aglycon, cyanidin, from tart cherries. J Nat Prod. 1999, 62: 802-10.1021/np990184z. Connolly DA, McHugh MP, Padilla-Zakour OI, Carlson L, Sayers SP: Efficacy of a tart cherry juice blend in preventing the symptoms of muscle damage. Br J Sports Med. 2006, 40: 679-83. 10.1136/bjsm.2005.025429. discussion 683. Bowtell JL, Sumners DP, Dyer A, Fo P, Mileva KP. 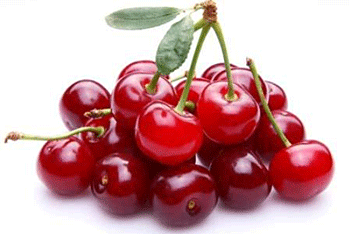 Montmorency Cherry Juice Reduces Muscle Damage Caused by Intensive Strength Exercise. Med. Sci. Sports. Exerc. 2011 Aug;43(8):1544-51. Kuehl KS, Perrier ET, Elliot DL, Chesnutt JC: Efficacy of tart cherry juice in reducing muscle pain during running: a randomized controlled trial. Journal of the International Society of Sports Nutrition. 2010. Oil That Burns Belly Fat and Increases Metabolism? Don’t Ignore Pain in This Joint!